It is a common homebrewers refrain: How can I keep my Kombucha brew warm, especially in Spring, Fall and Winter? Let the brew get too cold and the cycle slows down, reducing the healthy stuff in your brew and even exposing it to a potential mold infestation. Not good! Until now, standard beer heating belts and weakly powered seedling mats were the only choices available. If your house is cold, they won't help! 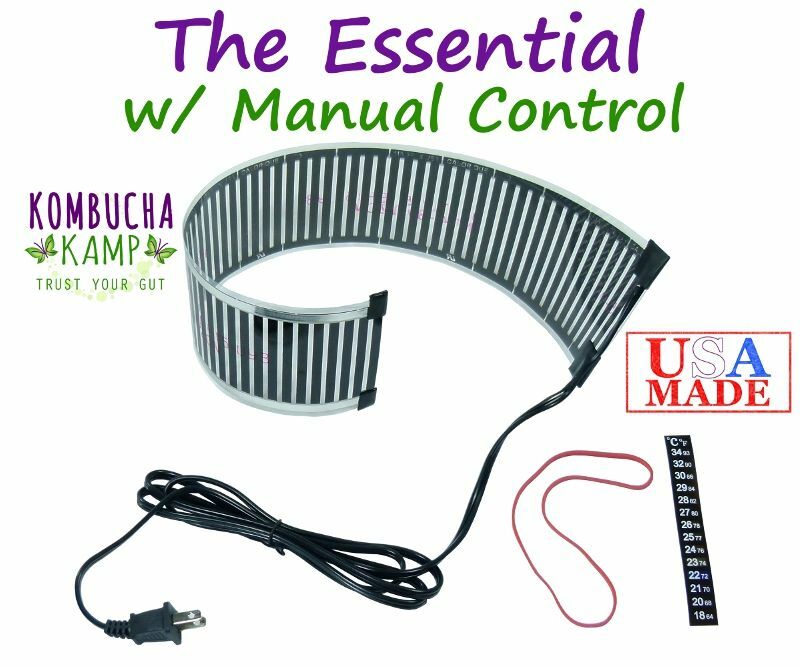 The Kombucha Mamma Year Round Heating System w/Dimmer was designed by Kombucha Kamp with the help of a thermodynamics engineer. Utilizing brand new technology perfected and patented only recently, this heating system is not only the perfect size to fit our Continuous Brewers but will keep your brew at the optimum temperature you desire all year long. Plus you can use this heating system with a gallon jar or almost any sized vessel too, anything 2.5 gallons or smaller. No wires so it's perfectly safe with glass! The only heating mat on the market specifically designed for Kombucha or any fermented food or drink really, COMPLETE WITH A DIMMER! Its ultra-thin construction & patented heating technology makes for a more uniform heat distribution which helps to maintain the ideal temperature for Kombucha, kefir, JUN, yogurt, or just about any type of home fermentation. Plus, the dimmer makes temperature control super easy. Simply turn it up when more heat is needed and decrease when the weather gets warms. Finally, you'll be in control of your ferment cycle all year round. Power cord with Dimmer with OFF and fully variable power let's you adjust your heating needs. Comes with 1 Year Hassle Free Guarantee! Works great! We keep our house around 66 in the winter and this keeps my ceramic brewing to 78 with it only slightly turned on from the left. I would recommend that anyone lives through Winter Seasons to invest in a Heating System as it provides and consistent temperature with peace of mind. I'm on my 5th Brew and am very happy with the results! Rachel (Cary, NC): Cooler weather was extending brewing time, and I feared getting mold. I was initially disturbed by the price, but having witnessed the consistent temperature with little surveillance, I have no complaints. Thanks also for the idea to let 2nd ferment bottles snuggle up to the heater as well. Great product! I just bought the year round heating unit. I have to say both myself and SCOBY love it. I live in Canada and winter comes fast and with fury. I also turn the heat down quite low at night time (I hate trying to sleep when it is warm) and even in my big vessel (3 gallons) it keeps my kombucha toasty warm without having to turn it right up to the top level. Having the thermometer lets me check the temperature daily...it gives me peace of mind. I love it. When I called to make sure the system would be enough for my 3 gallon vessel or if I needed to upgrade to the PRO, instead of telling me to upgrade (more $$) they told me to just put a towel around it. I was impressed they didn't advice me to spend more money which wasn't really necessary, that means a lot to me. I also bought some of their special tea blend. It makes for an awesome Kombucha. I will definitely order more. I would not hesitate in recommending both the heating system and the tea blend. Great job guys!!! This item works great to keep my KT between 75 and 85 degrees. Continuous brew is the ONLY way to go!! (Brazil) Great heating system! It adds the extra heat needed during the colder months to keep your brew going strong. I am loving the adjustable heating mat for continuous brewing. I have been enjoying it almost every day, and it is helping to wean me off of coffee. Your information was crucial to getting my home brew started, and I wanted to let you know how delicious my KT turned out. So Stoked! I totally love this thing. As a lifelong DIYer, I have a tendency to do things the hard(er) way sometimes thinking I'm saving money. When I got into kombucha and found Hannah I thought "This gal figured it out already, why am I trying to reinvent the wheel?" so I went all in with the heating system and I am SOOOOO glad I did. Thanks Hannah! GREAT heater! I live in the mountains so my place gets cold so quickly but the heater kept my kombucha at a steady temperature until I was ready for the second fermentation! !’ 10/10 recommend and it’s DEFINITELY your money’s worth! This heating strip is so easy to use and makes brewing kombucha so easy. I could not get consistent brews with the weather turning colder. I bought this strip and am keeping two 1-gallon jars and a quart jar at 82 degrees F. The SCOBYs are active and faster. Thanks! Great system. We keep our home a little too cool for kombucha to brew properly in the winter. Once I got it set up and at the temperature I wanted, it has stayed there. Simple to set and use. The product works great, just as described! My kombucha ferments a bit faster than leaving it at just room temperature, it's more sour, and the scoby growth is much more robust. I highly recommend the heat wrap for anyone needing to get a consistent temperature at or above 75 degrees. I'll admit it's a bit pricey .... but it works great. Buy with confidence! Love that it's made in the USA, goes hand in hand with the adhesive thermometer strip. Takes the guessing element right out the window! It gets cold here in Colorado, this heater really keeps the temp just right for my brew, I wouldn't be able to do without it, it really works good! It has lasted many years now, and keeps the temp very even. 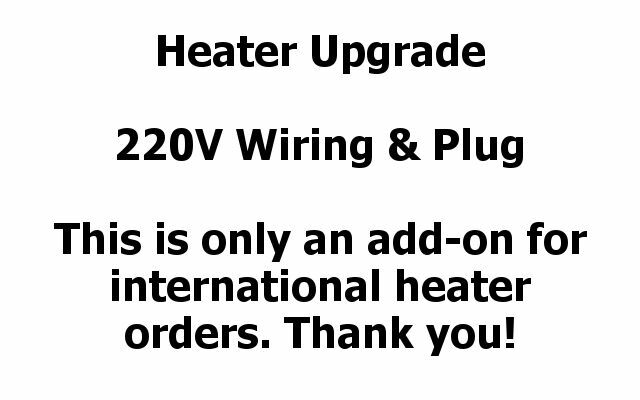 I purchased this heater with my continuous brew kit as I wanted to be able to control the heat without springing the extra money for a thermostat. As it is, I keep a daily log of the temperature of my batch and make minor changes to the dimmer anytime the temp begins to vary. Usually end up adjusting it every 3 to 4 days. I bought the heater with temperature control and now that the weather is getting colder, I'm glad I did. It works well. Quality heater. I keep my house at 74 and needed an extra 5 degrees of heat so these heaters are wonderful. I bought one for each of my 2 continuous brewers. A must have to get the proper carbonation. This was one of the best purchases I made. I haven't had to check my heat tape once. This heat tape keeps it at the perfect temp once I set it. I've gone through 4 batches so far and everything is perfect. I would highly suggest this if you want to make a batch and walk away until it's ready to test. We purchased the YEAR ROUND about a year ago, it worked great, until my hubby crashed into my crock and it was damaged. We then upgraded to the FERMENT FRIEND. My preference is the FERMENT FRIEND, the scoby it produces is BEAUTIFUL and the brew is very tasty. We are about to purchase a second one, so we can brew 2 crocks at once. I got the heater with the dimmer and there was no red light working and I wrote to them and told them the problem and they sent me a new one, I wanted to send the old one back so they could see it was not working and they didn't want it. They were fast and I was very impressed. Also I was going to call and order 2 scobys this morning and it said to call back. I then went to the store and ordered them and I was shocked today when I got a call from Hannah. They have a customer for life with me. I have never had the owner of a place call me to see what I wanted. I ordered other things and have been pleased with everything. I am so glad I found Kombucha Kamp. Hi, we got the heating belt for our scoby. It works like a charm. I am so glad we decided to get it after all, it is well worth it. I love this heating system. It makes making the Kombucha a much easier process. I simply check the thermometer strip attached to my vessel daily and adjust accordingly. I only give it 4 stars for one reason. The heating element control is extremely sensitive and you cannot tell how much of a difference a little adjustment will make. Other than that, it really makes a difference. Really love this heater with dimmer. They are performing beautifully and I am brewing like crazy. Thank you for your absolutely awesome customer service!!! I love this heater and dimmer. I got this during a cold Michigan winter after my boyfriend got me a 5 gallon oak barrel for brewing KT. My house was cold and drafty and it was hard to regulate my brewing times. The dimmer is very useful to make small adjustments so that you also don't "cook" your booch and the thermometer strip is essential to let you know when you need to make adjustments. I have not been using it since I moved to Far West Texas, but you never know when you might get a dip in temperature, and I'm sure I will use it regularly again when I move back to cooler climes. Definitely worth it! I can not tell you how happy I am now that I bought the "Year Round With Dimmer!" I like how the heating mat is ultra thin with a nice sturdy control dimmer box. If positioned right the cord and box can be out of view. I placed the temperature adhesive on my continuous brew and I also bought a few more for the others. After a few days I was able to get it to the temperature I desired and I just peek in on it as I get my Kombucha from the spout! Before I bought this gem I was only doing 1 container of Kombucha at a time but with my husband desiring to drink it as much as me, I needed to make more! Luckily for me I was able to take the heating belt and share it with another and then place two smaller containers up against them! When I hold my first Kombucha class with my friends and family I will be recommending they buy from you and specifically the Year Round with Dimmer!! A must have brewing my first batch in the winter seemed like a gamble but this little guy made things magical. It has kept Scoby and my brew safe and ready to drink. I love it if you are brewing I highly suggest you buy. I bought the heating system after I had some moldy kombucha! This has been well worth the money and I wish I had gotten it years ago when I first started brewing. I have a crock, continuous brew, and this heater works excellently. My brew stays at the right temperature, with very little adjusting by me. I love the thermometer to stick on the crock too - this is taking the guesswork out of it and produces delicious kombucha. Wonderful product that everyone needs. I bought the heating system because of the weather changing from warm to cold. I have it on my continuous brew container. The temp stayed firmly at 78 degrees once I adjusted the control. It's helped to brew my best yet! Well worth the investment. I received the heating system as part of the No Frills Continuous Brew system. In my opinion this is a must have to keep the temperature of your brew at the optimum levels. In the Pacific Northwest we don't get extreme temperatures but no way do I have the ability otherwise to keep my brew container around 80 degrees. This simplifies brewing and I only have to take an occasional peek at the thermometer strip to be sure it's in the correct range and adjust the slider as needed. Money well spent! I love this heater! It is very accurate, reliable and consistent. I use it in California during the Fall & Winter. When staying in colder climate in Montana we use it 3/4 of the year. Using it on my 2.5 gallon jars, the tea is ready in about 1 to 2 days during cold season. Excellent investment! I Love this heating system with dimmer. So easy to read and does an awesome job keeping it at the right temp year round. So glad I purchased it. It's a KEEPER for sure. I'm so happy that I chose this heating system with the dimmer control for my Kombucha continuous brewer - well worth the extra $ above the basic heating system! And it's easy enough to slip on and off so it can go back and forth between my Jun cb and the Kombucha cb - although I will be saving to get another one in the future, of course ;) Thanks for the amazing products and the astounding service! I bought 2 of these and I love them. After I got them set they maintain the temperature all the time. Also, they came fast. The service is awesome. What gave me the best results in my continuous brew approach was the heating strip I bought to put around my brewer. Now I can keep the brew at a consistent 78 F which scoby and the brew thrive in. All I can say is Hannah rocks with knowledge, product and just a deep desire to help. Charlotte PS Hannah's husband is also a sweetie and has helped me when Hannah was away. I love this year round heater with dimmer switch it has kept my brew in the correct temperature range, and the flexible thermometer is easy to know when heater needs to be turned on dimmed or off. Makes brewing Kombucha a fool proof adventure and pleasurable hobby. Very impressed with the belt and the great great support from Hannah. I use the site all the time and recommend it to everyone who's going to adopt one of my babies. No baby if you don't watch Hannah. Great site, thanks. I live in Wisconsin and my kitchen is rarely the preferred optimum temperature (75 degrees) to make my booch consistently week to week. This little heater has been remarkable at regulating the temp and keeping it right where I want it. I highly recommend it for you continuous brewers out there. Worth the price for sure! I bought the brew belt (Year Round Heating System) soon after my SCOBY and it is working nicely at keeping a consistent temperature. 5 stars. I doubt I'll ever look elsewhere for my Kombucha home brewing needs. Thank you for your commitment to quality. Wonderful healing system! It is easy to use and turn up or down. I love my heating element. I have it around my two pickle jars I use for brewing and it keeps them at the right temperature range. I check my jars every day or even several times a day (they're my babies) and I only have to make small adjustments to the heat wrap. So happy I have it. thank you, Hannah. Bought mine several years ago and now I am finally reviewing. I don't think it had a velcro strap included when I bought mine as I am still using rubber bands, so great improvement there! I keep my crock in the basement which is cool year-round. I LOVE my heater. Consistent temp and consistent brew all the time. I just bought the Brewers Cap and love that too. I really love this item. Easy, safe and not cumbersome. I enjoy the fact that I can brew without worry of fires and have a continuous temperature. Right now my setting is as low as it can get because the temp gets too hot otherwise. But that is just fine. My husband is so thankful that you have this item. I ordered this heater for my stoneware pot from Kombucha Kamp. It wraps around with a velcro strap, and the dimmer makes it easy to adjust the heat, as temperatures change alot in Iowa! When the temp was a little too high even on the lowest setting, I just unstrapped it, set it around the pot about an inch away, and that works perfectly. So nice to have a way to warm your brew and keep it at a constant temperature! I recently ordered more pots, this time I ordered the new Pro-line heater with dimmer which I will wrap around 2 pots, and I’ll move the regular size to my gallon brews, serpentining it between the pots. A must-have for brewing, and another genius invention from Kombucha Kamp! I am very happy with the heating belt I purchased from you. It does a wonderful job keeping my Kombucha just right ! And I don't have to fiddle with a belt that stays too warm all the time. I highly recommend this item! 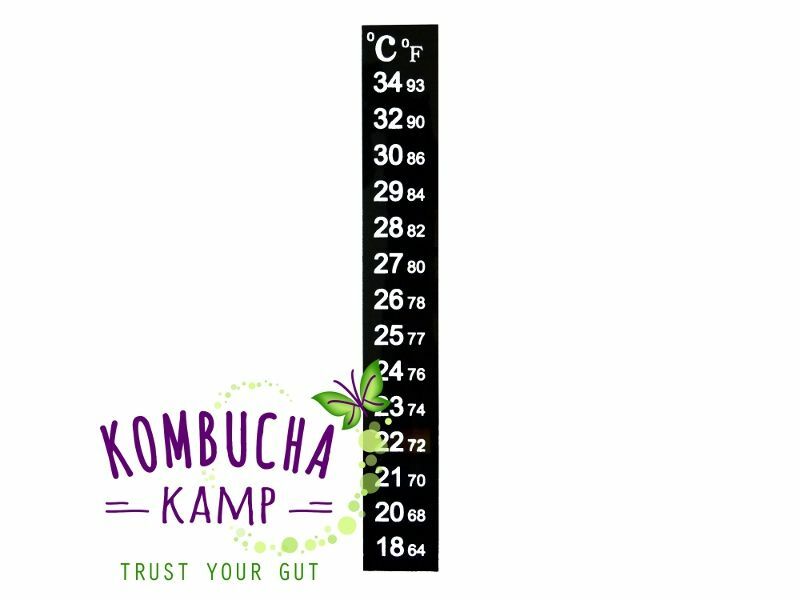 I used to use a flannel covered heating pad to keep my kombucha warm in winter, and then I discovered KKamp's fabulous Year Round Heating System with thermometer! I am so very pleased with the brewing results as well as the pleasing aesthetic of the black heating strip....looks great and works well. I also appreciate the exceptional customer service when I needed to solve a problem. THANKS!!! I'm very satisfied with the year-round heating mat with dimmer control. The temperature has been very consistent for my batch brewing. The newsletters and emails, as well as the information from your web page have been invaluable. I am a very satisfied customer. I would recommend this highly! Thank you for all of your knowledge and support. Love this heater! It is easy to use and turn up or down. I have been able to keep the warmth fairly stable from 78-84, with an average of 80-82. I periodically check the temp as the climate gets colder or warmer and adjust the dimmer accordingly. I have a continuous brewer, but also used it for a while on some batch brews. 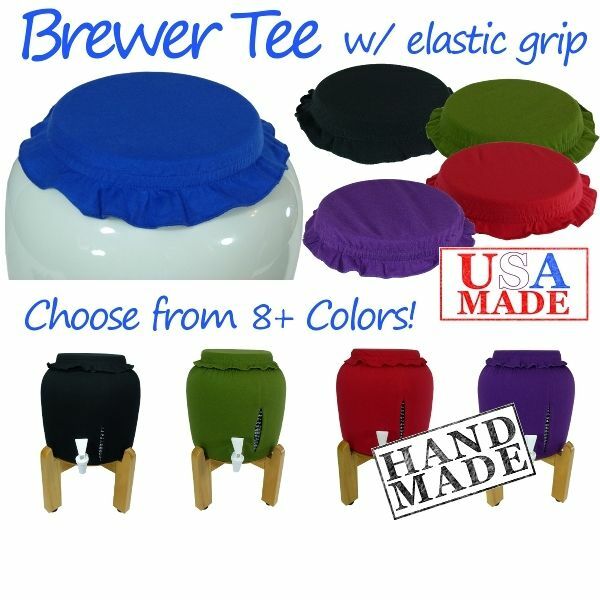 Works great either way, but fits more nicely around a ceramic crock, especially if you buy and use the cotton “t-shirt set” which keeps the heater band nicely wrapped around the crock, looks terrific, and adds a little extra insulation.
) I purchased the year round heating system with dimmer as I live in NYS where it is cold for a good part of the winter. This system has kept my Kombucha brewing at a consistent temperature and I found it easy to set up and adjust. This leaves me free from having to keep a watch on the temperature and I can go about my business. A wonderful system. The heater is very powerful and it became too hot using the velcro band (on the stainless steel vessel), so I just let it sit around the stand loosely and it maintains 80 degrees. Keep an eye on the temperature for the first few days until you get it just right. It speeds up the brewing for sure! I ordered the Complete Continuous Brew package. I am thrilled with all of the products. The brewer is beautiful and the heating mat allows me to brew a batch of KT at optimal temperature. It also allows me place individual gallon jars of on the back side of my Brewer and keep them up to temp too! Now I can keep enough Kombucha on hand to meet my needs and even share some. I especially love the batches brewed with Hannah's special blend of teas! New to making our own Kombucha. First batch turned to vinegar. O well, now we have about a gallon of vinegar to use. Isolated our problem due to not maintaining sufficient and consistent temperature. Got the Year Round Heating System from Kombucha Kamp and second batch came out perfect. Thank you Kombucha Kamp. We love the heater and wrap it around 2 one gallon jars. Works great. Have 4 new babies from both batches. Starting third batch now and putting babies in a new hotel. Thanks again Kombucha Kamp. I love love love this year round heating system! It keeps my 2 gallon vessel nice and warm. It's such a nice gentle consistent heat. I've got a batch ready about every 7 to 9 days. Very well made. Kombuchakamp has incredible customer service. I am very impressed! I purchased the year round heating system with dimmer and it is so easy to use, I barely have it turned on and it keeps my kombucha nice and warm. I got tired of moving my kombucha to different locations in the house to find a warm spot and wrapping it up in a big towel was a pain. Now I just have it on my counter in the kitchen which makes it easier to monitor. The customer service is outstanding. I'm new to brewing kombucha and I had so many questions and concerns throughout the process but they responded quickly and professionally. I've only been using this warmer for a couple weeks but so far I'm loving it! Due to changes in our kitchen I had to re-home my Kombucha. It's now tucked nicely into the corner of the counter but it was dreadfully cold there. My last batch of booch took over a month to brew. After just a week I have a beautiful new scoby forming and the brew tastes almost ready. I liked that an adhesive thermometer was included with my purchase although I already had one on my jar from a previous purchase. We had a couple really cold days where I needed to turn the heater up a bit. Today it was really warm out and I was shocked to see my booch around 86...so you definitely need to check it periodically but otherwise it does its job well. The year round heater is great! Our house is around 58 degrees until my husband or I get home but it takes only 5-6 days to brew. Fabulous product. Easy to use & allows me to brew Kombucha all year round with consistency. The option of the international wiring upgrade meant I was able to plug it in as soon as I received the product without having the fuss off buying a converter. Thanks Kombucha Mama. I give this product 5 stars. This is working great for me in my home this fall -- where we haven't used heat yet, even though the nights are getting into the 40s and the days in the 80s. It's been very easy to make slight adjustments to the dimmer to keep the brew cozy and in the upper-70s even thought the room is probably 65 degrees (or less) in the mornings. I've decanted three times and each brew only took 7 days, so I know the even warm temps are making that happen. I love my kombucha Warmer. It really makes a difference in the fermenting time! Making lots of kombucha tx to my warmer. Easy to use. Thermostat works great! I give product and service five stars!!! Tx. The heater has worked well for the past month that I have had it. It arrived very quickly. I use it intermittently at this time (fall) but may have to use it full time in the winter. After researching your website on how to make kombucha properly, I decided to buy the heater. It only makes sense to use the heater to make it more consistantly. It works like a charm! 7 days and it's done at ~80 degrees. Love this heater! Thanks for all the great info. I didn't use my heating strip with my first brew and it took almost 30 days to brew. This time I'm using it and 2 days later I can see a difference. I think I may be harvesting booch in a few more days. Thanks Hannah, Love your store!! Excellent for the cold climate of our cabin in the Rocky mountains!! It has helped us to produce a high quality kombucha despite the constant temperature of around 60 degrees Fahrenheit! Our mother culture has just thrived so much since we started using the heat strip...bubbly, yeasty, and ever growing!!! We produce a brew much quicker now too. My only wish is that there was a pointer on the dial that made it easier to tell where you are in the spectrum of heat...great product otherwise!!! I have recently purchased the Year round heating system with dimmer.What a great invention .I don't have to worry about the brew getting to hot or cold.It works like a charm. With the Thermometer the are a dynamic duel. I purchased the year round heating system with the dimmer switch. The flexibility of the heating strip is great! With the addition of the adhesive thermometer strip on the brewing jar, it is very convenient to monitor the temperature of the KT. The adjustable dimmer switch allows for easy adjusting when needed. I have recently purchased the heating strip because with the air conditioner on my tea is not warm enough! I love it and hopefully it will brew faster with the heater! I'm doing continuous brew in a crock and using the heater that I think really helped to keep the temperature up and constant. Once again Hannah delivers a quality product, quickly. The dimmer switch makes ALL The difference, as I live in a very cold state in the winter, warmer in the summer. I have my own vessel, but needed a reliable heat source. The heating strip is very flexible, and fits perfectly around my 2 gallon glass jar. The adhesive thermometer is a great way to monitor the temperature. A MUST HAVE if you live in a cold climate. Thanks Hannah! Happy brewing. This is a very good item to help keep your kombucha brewing in colder weather. Love my heater!!! When I am away I come hope to perfectly warm, happy Kombucha brewing away right on schedule! Even when we turned the heat way down in our absence! Love this heating strip! I check the temperature daily and it keeps the temp perfect. I tried a batch without the heating strip and it was slow and didn't work well. I have friends who don't use heating strips and they don't have consistent results. With my heating strip I have consistent results all the time. I can count on it. The heating strip with dimmer has made my continuous brew practically fool proof! I tried a heating pad in a cooler previously with a gallon jar. Waiting, waiting to have a batch only to discover mould. This is great, have a glass anytime. Thank you. Love having the heating system with dimmer. Our house is 66 most of the time, and I would not have been able to brew without this. On warmer days I can turn it down just a bit. I Loved the Year Round Heating System I got with my Continious brewing System so much I ordered 2 More.....What Can I say Hannah I'm Hooked on KK!!!!!! I also love all the Information you are so kind as to share with us!!!!!!! Cant say Thank You Enough!!!!!!!!!! I received the goods on time and am loving the product. Living up North, this heating mat is a "must have". Very easy to use and Kombucha Kamp is very helpfull and have great customer service! I also purchased the heater with dimmer system. I am so glad I did. In the past, because of the cool temps, it could take as much as three weeks before my Komboucha was ready. I had it good to go in 10 days. I live in northern MN, we keep our heat lower 66 degrees. I like the fact that you can control the heat. Keeps my CB at 82 degrees, and I know without the heating system my scoby would be half the size it is now. Product works great ...would buy it again. I recently purchased a scoby (which came with a sample of Hannah's special tea blend) along with the year-round heating system/dimmer. My scoby was such a happy little mama in her warm & cozy little vessel! I just bottled my first brew today. I couldn't be happier my purchase! Not only was the dimmer a perfect addition to my set-up, but the scoby was in beautiful condition and Hannah's tea blend was lovely for brewing. Thanks, Kombucha Kamp! Living in Michigan I really needed some help to keep my kombucha brew warm and happy. This heater is perfect. After buying this heater I had the best tasting kombucha ever. It's worth every cent that I paid. Thanks Hannah! I live in the Mountains in a Dome Home and have a pellet stove for heat. It has no thermostat and has to be managed manually. I am grateful for the heat strip with dimmer because it makes it easy to control my temps and with the aquarium type thermometer it is so easy to see just exactly what's going on in your brewer. I will be ordering another one next week to go with my second continuous brewer. I can easily put out 14 bottles of second fermentation each week with two brewers going. That will keep us totally stocked up with some to share....that is if I don't drink it all myself ;-) Thank You KK for doing ALL the work for us and making it soooooo easy! I debated and debated whether to invest in this warmer. Almost bought the one without the dimmer, but in the end, and after reading the reviews, decided to get it. I'm so glad I did. Our house tends to be cold and ther are few places I can keep my brewing crock. Since putting the warmer on, I have been able to keep the temp around 76 (from 64 without). The dimmer is worth the extra money, as I can keep my eye on the temp and adjust as needed. So glad I got this! Since our weather fluctuates through the seasons, from very cold to hot in Toronto, Canada, I love using the heater with dimmer control. I keep it loosely placed around the jar at an even 80 degrees according to the thermometer gauge. After having a lot of difficulty getting my kombucha to brew, I determined it was just too cold in our house. The heater works like a charm. I've used it on one-gallon and two-gallon jars. Adjusting the temperature was easier than I thought it would be. (I did have to purchase more thermometer strips for switching up jars.) Right now the dimmer switch is set at half way and it's keeping my two-gallon jar at 80 degrees. I now can have kombucha in 10 days instead of 3-4 weeks. This was a great investment. I could not regulate the temperature of my KT glass jar no matter where I put it in my home. I saw this heater, watched the video and purchased it. My jar's temperature is now maintained and my KT has been doing a continuous brew successfully & deliciously now for more than a month. I love it! Adding the heating coils to my brewing container, along with the cover, made brewing in my Pacific Northwest climate so much better. I previously used a seedling heating mat to try to keep it warm enough. It was always "iffy" as to weather it was right. But now, my Mother Scoby is happily brewing continuously in proper temperature to keep it safe and active. It makes it so easy and convenient. I love it! 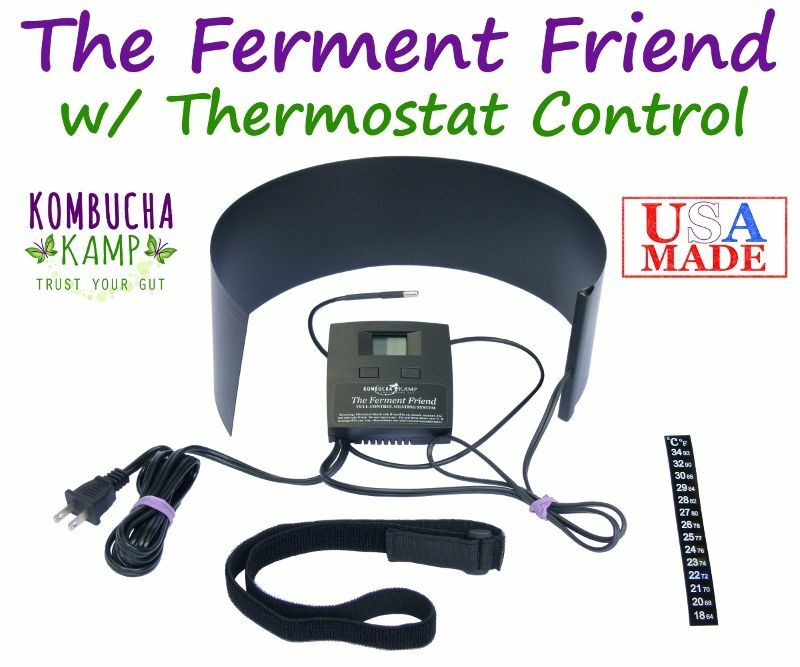 If a person is enthusiastic enough about Kombucha to be considering a heating system, this is a must have! My brew times are shorter and more predictable. Works great and simple to use. The year round system with dimmer worked great for making kefir! I'm ordering the essential heating strip for my father because he keeps his house much warmer than my apartment at night. Thanks for these great products! We started brewing in the summer, so even though we are in northern NH, we have only just started to use the heating system. With direction from Hannah, we realized that the dimmer had to be set to a particular point for it to work the best. Our kitchen stays around 60 and this works perfectly to bring the temperature into the 70's. I love my heater. Its so nice to be able to adjust it. Its big enought to heat three containers. Its so flexible and easy to use.. I can tape it to my Kombucha, or set my Kombucha on top of the heater. The free thromometer is really helpful for adjusting the heat on the barrell. I ordered the wrong heating unit but was able to easily return it for a larger one. I am a small business owner who teaches others how to make Kombucha, along with canning, pickling and fermentation. Living in Chicago and being frugal with the heat, the heating element keeps my Kombucha alive. I even used it yesterday to heat up my Daisy Butter Churn (glass) to make some butter. I Bought this along with the stainless steel version of the CB no frills system ( which I love btw ) , had a little problem with the first one but got my replacement very quickly, thanks Hanna. It works perfectly and I would definitely recommend getting one, you will not be sorry. I will be ordering a couple more so I can use them on my fermented vegetable and Kefir batches as well ! The heating mat I bought from you, has been functioning very well - I will give it all the 5 stars ! I really appreciate that! I will recommend this product to all of my acquaintances on the facebook kombucha brew group and tell them about your fantastic customer service. Thank you so much for providing such high quality products! I can't tell you how much I appreciate it! I’ve been using this heater since May and it is a really great product! I had a problem with it a few weeks ago, but Kombucha Mamma sent another unit out promptly with no charge. It works great and so easy to use with the Heating System and Dimmer I can rest assured that my tea is brewing at the right temp. Thanks so much what a great Bucha Team! We give Kombucha Kamp 5 stars for above and beyond customer service with our recent orders. We received prompt service for two orders and were happy with the quality of products that we ordered. When we had a problem with the year-round heating system, we expected the process of updating the system to take 2-3 weeks. However, the people at Kombucha Kamp took care of the problem in less than a week. We are very pleased! This is a must for Alaska! I started my 1st brew without the heating strip, the process was taking entirely too long for my liking. Once I loosely put the strip around my gallon jar, my scoby grew beautifully and my kombucha turned out delightful! :) Thank you Hanna for all of your wonderful products, awesome knowledge and Rockstar customer service! There's no doubt that I will be a repeat customer! Living in the Pacific Northwest, the temp needed to make Kombucha tea was just not happening. I was making my first batch and really started to worry that it would fail. I saw that Hannah had developed this heating element with a dimmer and was excited to find something that would help. I was a little worried about the cost, but I knew I needed something. I ordered it and I couldn't believe how fast it shipped to me! Since my container of Kombucha tea has been given the extra heat, my scobi has thrived!!! So glad I ordered this heater. I don't think my tea would have made it! I live in Philly and experience all seasons to the fullest, varies from cold to hot. We keep our house thermostat pretty constant. This heating pad with adjustable temp works great. It takes minimal time to figure out where you will need to dial it to but once you figure it out its perfect. You can raise it by 1 degree F or even 10 to 20 degrees higher if you needed. Plus who doesn't want an extra thermometer! I purchased the heater with my continuous brewing system. As it was designed for it, it fits and works perfectly. Everything is tucked inside the tshirt cover which holds it in place. The cord snakes under the CB stand. A well designed system. It took me a couple of days to play with the dimmer to get the temperature just right. So easy to use. I am so happy that I have the deluxe heating system with the dimmer control switch. It has taken away all the concern of the long cold winter, especially living in the basement of our house. I would say that it is an absolute essential here in the freezing north. Thank you so much, Hannah, for designing such a neat-fitting, practical heating system. I have been brewing, albeit slowly, for the past year UNTIL I ordered this wonderful, controlled heating unit. What a huge improvement and a milestone to speeding up the brewing process over just the ambient room temperature variances! Thanks. PS: I would recommend putting a simple statement in the package with recommended Kombucha brewing temps. Absolutely a MUST HAVE item for the successful brewer. Great product for us Booch brewers in the Pacific Northwest. After a day of acclimating to adjusting the temp dial to the included temp gauge, I've stopped worrying about my Booch. Babies are growing faster. Thank u! Living in the Pacific NW, it's hard to keep a high enough temperature to keep our KT warm enough. As we began looking around the internet for a solution, everyone who is into KT suggested the KK heating system so we decided to give it a go and what a difference it has made! Our KT is brewing along happily at an even 80 degrees and producing some great KT. We recommend this product to anyone wanting to maintain an even year-round temperature for their tea. We are sharing the information we have learned to all we know. I live at 8,000 ft. Elevation in the rockies, the switch is set to low in the summer in order to hold my brew at an even 77 degrees. I'll turn it up as the seasons change. Very simple and easy to use. Excellent Design, fits my Artisanal Crock Perfectly. I've been using your Year Round Heater and it works great!I told my friend to type KombuchaKamp.com into her web browser ASAP for great advice and videos!! Thanks for all your info and supplies! I'm very happy with my new heating system and the customer service offered by Kombucha Kamp. I had a problem with my unit shortly after I received my order but Kombucha Kamp sent another unit out promptly with no charge. It's working wonderfully now and I'm heating 2 - 2 1/2 gallons of continuous brew along with another 2 gallon container all with this one unit. I love my Kombucha! If you're not sure about purchasing the year-round heating system (like I was), JUST DO IT. This works like a dream. After using seed germination pads which, at the most, will raise the temperature about 5 degrees if you're lucky, I bit the bullet and laid out the cash. I am now free of constantly trying to monitor the warmth that my brew was getting. My cold, very cold, kitchen could not maintain the temp needed for a successful brew. You will need to play with it a bit to get it regulated correctly (just a couple of hours) but then it is on auto pilot. The temperature gauge is VERY sensitive and just a TINY move up or down is all you need to change the temp in the event of a warming of outdoor temperature. You will not regret this purchase. It will make your brewing of Kombucha a fun and stress free experience. Thanks Kombucha Kamp !!! Keeping my brew at an optimal temperature is a challenge here in Denver, CO. Hannah's heating mat w/dimmer is perfect for our cold climate. I especially liked the video about the heater. Thanks Hanna for a great product, great customer service and a wonderful website that keeps us all informed! I live in Vancouver,BC and it is challanging to keep my CB system at a constant 78-80 degree F during the winter or fall. Even the 1 gal jar on top of the fridge can only reach 71 degree. I am so glad that with Hanna's Year Round Heating System with Dimmer, I am keeping both of my 2 gal CB jars at a constant 78-82 degree. I am now harvesting 2 to 3 qts of KT every 4 to 5 days. I have more then enough of KT for my own family of 3 and a lot more to share and introduce KT to my friends and yoga students. Thank you so much Hanna!!! One question for you Hanna, Can I use organic coconut palm sugar for brewing? really fast shipping, and awesome products & costumer service! would suggest this website to people. This was the best thing I could have done for my SCOBY. Before, my growth was slow and created very thin babies. After purchasing this heating mat my SCOBY has thrived and created beautifully thick babies. Anyone that lives in CT, this is a must! Not only is this heating system 100% awesome, so is the customer service here at Kombucha Kamp! The first heater that was shipped to me ended up not working properly. After a quick email exchange and some problem shooting, Kombucha Kamp determined it was a bad heater and shipped another one out to me right away. I had the new heater within three days and my kombucha has been brewing so much better now. Any time I had a question about my order or my first batch of kombucha the emails were answered quickly and in a friendly manner. This day in age, great customer service is very hard to come by. Thanks Kombucha Kamp for being a wonderful company with outstanding customer service and great products. This heater is perfect! I live in Canada (cold winters, hot summers), so the thermostat lets you adjust the temperature easily. I would recommend this to everyone brewing their own Kombucha tea! I can finally have peace of mind!! Before discovering Hannah's site, I was using a dehydrated scoby and a seedling heat mat. That ended up being a complete disaster. I never knew the temperature and had no control over the viability of the scoby. Perhaps that is why I greatly appreciate Hannah's heat mat with dimmer switch. I finally feel that making delicious kombucha is within my control. I love everything about it, but especially the ease of mind with brewing kombucha to get the perfect more delicious batch every time. No more guessing and dialing the dimmer switch is so much fun!! Finally, I have something in my life I have perfect and beneficial control over...a perfect batch of kombucha using this incredible heating strip with dimmer. Thank you so much Hannah for going the mile to develop this incredible product. Love it!! I had given up on brewing my own Kombucha as my house is too cold and my air vents are on the floor. I could not put the bottles next to the vents then, as I have a dog in the house! I must write and tell you that your heating strip is fabulous, simply amazing. Thank you so much for ‘inventing’ this. It will pay for itself in a little while as purchasing kombucha is not cheap! I was SO excited to get the heating system with dimmer! Our home remains at around 69 or 70 degrees for many months of winter and that is not warm enough for the kombucha to be happy. I purchased the heating system and have been immensely pleased to be able to keep my kombucha brewing at a constant warm temperature. I love having the dimmer to adjust the temperature as needed if the house is getting cooler or warmer! Thank you so much for this wonderful kombucha brewing tool!! I highly recommend it and it is worth every penny I paid for it! thank you for the awesome customer service! In this day and age that is a very rare thing to experience. The New Heat Mat arrived Yesterday and works awesome! It dials up and down and is keeping my kombucha between 78-80. Perfect. the year round heating system has improved the consistency and quality of my brews. it's an indispensable tool for brewing in cooler climes. thanks for the excellent product AND customer service!!! I live in MN and this was my first winter brewing Kombucha. I keep my house at 70 degrees but the only place I could put my two 2 1/2 gallon jars as well as four 1/2 gallon jars was on my kitchen counter, which is on an outside wall. My scobys were very cold and not doing well. Come to find out, the temp of the Kombucha was in the mid 60's. The heater is perfect! I can intertwine it around every jar so at least one side touches the heater and that's all they needed. The dimmer is also a must for me as they got a little too hot and then I adjusted the temp. Now they all stay around 75 degrees which is perfect Kombucha for my family. 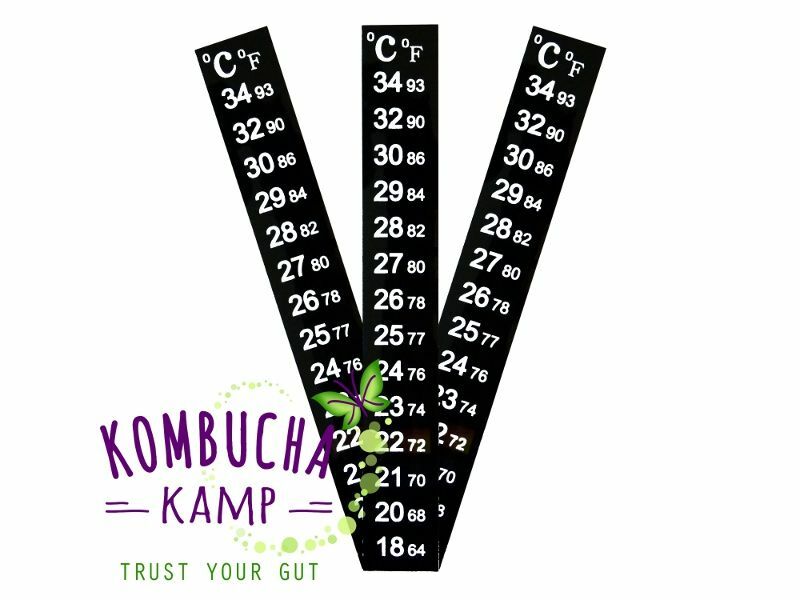 Thank you for making this heating strip specifically for Kombucha brewing! I am very happy with the Kombucha heater with rheostat. It was delivered quickly and packaged well. My kombucha is now delicious and dependable. Thank you! I live in Texas and while are winters aren't usually cold this one has been. I love my heater and can't imagine brewing without it. I have kept my CB at 76-82 since I started Feb.5th, 2014 and I was able to start drinking my booch on the 13th. I love the heating system with dimmer. It was a "must have" for me since I keep my house on the cool side. Highly recommend it! I really love this heating system. During the winter our back bedrooms get in the low 60's and during the day in the upper 60's. After a few days of experimenting with the dimmer, I have the temperature to where I want. Thanks for a great product! I have both a three gallon (plastic) and a five gallon (glass) vat for continuous brewing. I bought one of each heater, a small and larger, to match my vats. If I were doing it again, I would order two of the large styles, mainly because of the volume control. Both work well, though the larger one allows me to keep my kombucha at 78 degrees precisely. In the winter, our kitchen is about 65 degrees, FYI. Love my heating system with dimmer. Works great. I had a problem with the first one I ordered and Hannah was on it in a flash. She fixed the issue immediately and I was very happy. Great Customer Service. Great Heater. I highly recommend getting one. I opted for this heating element for a specific cold place in home for my oak barrel brew. Hannah gave me excellent customer service when I had questions. Thank you Hannah. I live 30 miles north of Seattle and it has been very cold this winter, last weekend we were down in the teens and it was cold! Not helping the situation is the fact that my home is over 100 years old, poorly insulated with only a central gas fireplace for heat. This would have made it impossible for me to keep my Kombucha alive through the cold spell. Thankfully I bought the year round heating system and have wrapped it around my two 5 gallon continuous brew systems on top of my refrigerator. I am new to brewing and just started this summer. I purchased a dehydrated scoby from another source and found that I was having problems with it. After months I had not grown a baby scoby, which does not appear to be normal. Once I got the year round heating system though my tea tasted better and I started growing a baby scoby! I didn't realize how much the temperature would make a difference. Without the YRHS I don't think I would be able to brew my kombucha. I am so thankful for this product and I HIGHLY recommend it especially if you live somewhere that gets cold in the winter. Heating system totally delivered for me. It kept my booch at 77-79 degrees consistently and in 7 days i had my very first ever gallon of booch. I am sure there are many other devices that MIGHT work to heat your brew. This, however, is the tool that makes you feel safe and efficient. It is flexible and can adapt to whatever containers I want to wrap it around. Keeping your brew at a consistent temp produces a better product - at least I notice mine to be a lot more bubbly (which I LOVE!) I was hesitant about spending this much money on it at first. After a few batches I am thinking about buying another one (only because I Love having several gallons brewing at once). If you really enjoy your brew you will love this heater! Thanks Kombucha Kamp for making a great product. The heater makes it simple to keep your brew at the happy temp and speed up the process. I found it easy to operate and easy to regulate, I check it a couple of times a week now, but it stays right at 80 degrees. Really speeds things up. Thanks so much! I purchased the year round heating mat because we like to keep the temperature down, in our house, especially at night (who can afford the power bills?). The mat arrived quickly and I put it right on our crock to start our new CB method. It took me a little trial period to get the temp regulated the way I wanted it, but now it pretty much stays the temp I want it at. The best thing is that now I get a new batch every three days! My 2nd brew gets started that much faster and I get a steady supply of tasty booch to enjoy! I've even found that I like the taste of my booch, right out of the spigot, without flavors added to it! Thanks Kombucha Mamma for all you do to help us out and for designing this great product! You rock and so does my booch, thanks to you! Great tool for a perfect brew! I live in a cold-winter area and this has helped my batches stay consistent. Happy I made the purchase! My standard heating pad worked just as well to keep my kombucha brew warm in my chilly Oregon basement. HOWEVER... I trust this device to not light my house on fire and it is large enough that I can put my 40oz bottle of brew which is undergoing secondary fermentation next to my large brew vessel and wrap them both up for warmth. I love this KT heater. I can adjust the heat to accommodate my brewing needs (warmer = faster; cooler = slower)--changes up the taste. I keep my house cool so it was harder to get my KT to brew to the flavor I wanted in the time frame I wanted. Now, I just monitor the temp on my brewer and adjust accordingly. I definitely recommend the use of this heater; I want another heater for the 2nd fermentation. Thank you, KKamp! Just had to have another one for more CB gallons. Since it's cold it keeps them nice and warm/all I know these heating elements are awesome. Now I don't worry about if they're being kept at the right temp. I ordered the this heating system when the late fall Michigan weather made our house too cool to brew. The system arrived quickly and I started a new batch with the heater. Even though it looks a little funny it really works well. I wrapped an old knit scarf around the out side of everything was able to turn the dimmer down a few notches. Also - I want to say thanks for the quick responses to my questions! My dimmer heater arrived just in time as the weather has turned cool. The dimmer switch is great, although I am still trying to find the right setting. Markings around the dial would be helpful. OMG! Your customer service is the best ever. This heating system has saved my scoby's life. We live in the south but that A/C is always running. I have it tucked under the t-shirt and I'm still able to keep a close eye on the temperature. I make slight adjustments to keep it in the proper temp range. It has allowed me to finally have success in brewing my Kombucha. Thanks Hannah for all your helpful information and products! The best addition to my CBer. Keeps it at a perfect temp. Dimmer is great. Would absolutely buy again. I exchanged the other heater for this one, because it was hard to control the temperature without the dimmer switch. I found this heater to be much larger than the other heater also, so it's a tight fit under the tee set but I made it work. I think this heater will be invaluable for the cold winter days ahead. I really like the thermometer strip as well, I know what temperature my brewer is at just at a glance. I am especially impressed with Hannah's customer service. The year round heater with dimmer switch makes kombucha brewing easy!The dimmer switch helps me precisely control the amount of heat on the brewer. This is a benefit in air-conditioned rooms. I would recommend this heater to anyone in colder climates as well. I really like this warmer. Simple and easy to use. It takes the guesswork out of wanting to know if the temperature is too high or too low. Great invention, Kombucha Momma. works wonderfully! the taste is more apple-y just as I'd hoped. 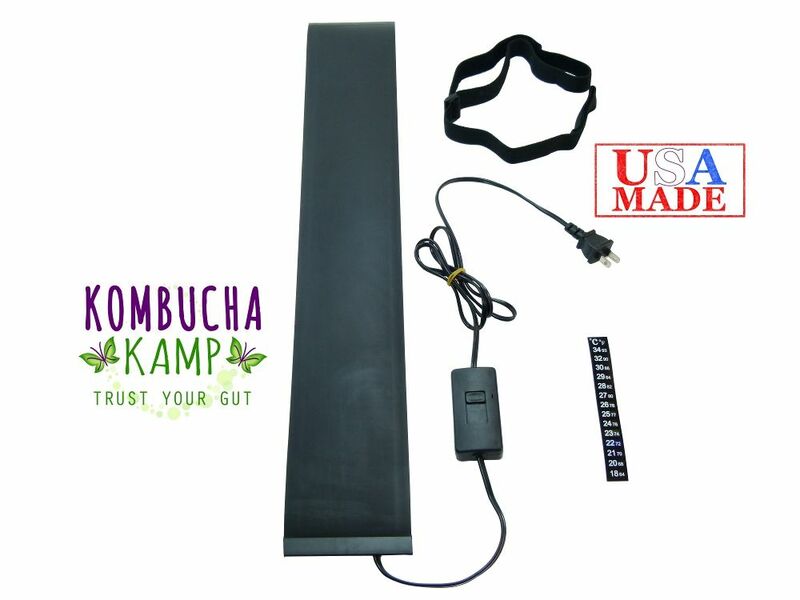 The Kombucha Heating Mat System with Dimmer makes the job of keeping the Kombucha at the correct temperature easier. I live in a cool climate and this Continuous Heating System is vital to my brewing success. It is easy to adjust the dimmer to keep my brew at an optimum temperature. I knew before I started brewing that I'd need a heat source, and this is system surpasses them all. I'm so grateful for its availability. The heating system is great! It makes it so much easier to regulate the heat. Highly recommended! I live in NE Wyoming and this heater is just what was needed to keep my 5 gal oak keg from Kombucha Kamp in the right zone. I love how easy it is to adjust the temperature. I'm a newbie at this and didn't want to make the mistake of potential failure! I started brewing kombucha last October. We keep our house pretty cool, so I was having trouble regulating the brewing temperature. Once I purchased this heating system, my problems were over! I ended up adding a whole second system, because this was so easy to control. I now produce two gallons of delicious kombucha every day, thanks to the kombucha mamma year round heating system. This is an absolute must if you live in colder states! Once I set up my CB and looked at the temp it was around 65 that is 10 whole degrees less then the minimum temp for the SCOBY. The strip is so easy to use and you can feel the heat evenly distributed throughout. My friend is trying to get by with a heating pad until she can buy the heating strip and it is almost impossible to keep an even temp without going over the dangerous 85 degree mark. If you buy the deluxe kit like I did you even get $30 off the strip! My kombucha taste so good, when I use to make kombucha the batch method with out a heater I use to like the store bought more them my home brew, I just could never get it right now I LOVE my home brew SO much more then the store! Thanks KKamp for wonderful products! I cannot live without this heating strip! Its perfect, especially if you live in less than ideal Kombucha climates. I have always lived high in the mountains where the climate is not exactly warm 24/7. :) Without this heating strip, perfect Kombucha just wouldnt be possible. Dont mess around with cheap versions--- if you want good tea, make the investment and it will reward you. I can keep my tea perfectly monitored at just the right temperature and can adjust it as need be. It would be such a hassle trying to make perfect tea without it, and always having to cross fingers that its getting enough warmth. Leave it to the strip and youll have perfect Kombucha every time. The year round heating system is a great thing to have. I live in Canada and our home has more than a few cold spots. On the third day I could spell the vinegar smell and was concerned but found out that vinegar is the sign of a healthy KT. It would be difficult for me to keep my brew at a consistant temperature without this thermostat. A must have if you are looking at brewing KT. I live in Canada where our winters are pretty cold. Brewing kombucha was complicated. After loosing a batch to mold ( it was -30°c outside, it was a bit hard to keep warm). I, then, decided to buy the year-round heating system. I am so please with it! It is easy to use and really convenient. The temperature can be adjusted with the dimmer and I can now have a warm brew all the time with faster cycles. Thank you Hannah! I live in Montréal and we have 8 cold months and only 4 "decent" Kombucha ideal temperature months. I was heating the entire kitchen just to keep my scobys cosy and alive but my electricity bill was starting to get crazy. That's why I got the heating Mat with dimmer and I am very very happy with my purchase! I now have 4 big glass containers brewing Kombucha and all of them feel good to the touch and not cold as they used to. My cultures are brewing faster and I dont need to heat up the entire room!! Thank you so much Kombucha Mamma!! Believe it or not, we get very cold in the winter here (for Kombucha); with no indoor heating, my thermometer often reads 52 degrees on the back lanai in the morning, until the sun hits. I quickly realized that I needed a heating strip with dimmer, to be a successful brewer. Still new at it, but I've already ordered my second kit, with the year round heating sytem, and I swear by it. Highly recommend for practically everyone to keep a perfect temp for the Booch. And I have my two crocks, with tees, sitting side by side on my counter, actually looking great, and blending right in with the kitchen. Tees and strips are a perfect combo with the CB system. I am definitely hooked, and probably going to order my third kit!! I bought the year round heater for my kombucha. I live in Wisconsin in a farmhouse so a constant temperature for the kombucha is difficult. I have been impressed with this product. My kombucha flavor profile is impressive and it gets fizzy. My kombucha has never been fizzy. It is no doubt because of proper temperature regulation. I also appreciated the thermometer- simple but so handy and necessary. This product is very easy to use and will ensure many years of making the perfect kombucha. I'm enjoying my continous brewing system, the SCOBY I received grew to brewer size in the first week, yeah! I also purchased the heating system with dimmer and one heating system without. I like the dimmer one alot and as others have said once you find that sweet spot, my need for adjustment is minimal. It has been a great experience, now I have two running. Wondering what would happen if I mix Hannah's SCOBY with the one I grew from a health store bottle of KT? Would one bacteria kill the other? War in the brewry. the system is great and I've brought the kozy too. Before I had a towel wraped around to keep the heating mat in place. Much better looking on my counter. Thanks again Hannah. I got hooked on drinking Kombucha tea last Summer. By early December, the passion of brewing my own KT was absolutely overwhelming. It wasn't the price of commercial KT that moved me, it was the romance of participating in an age-old multicultural tradition that I fell in love with! The room I have my two-gallon batch of KT sitting in is a constant 62 deg F all Winter long, so I got out the heating pad I once used for my lower back. Dang! Set on Low it was way too hot. No matter what I did, I could not keep my KT between 70 and 80 deg. My first batch was, in a word, underwhelming. I needed a solution that worked, but what? I turned to the wise servers at Google for direction – and they directed me HERE! KombuchaKamp! I had never seen anything like the wrap around heating strip that Hannah sells. Very intriguing. Heat from the side instead of the bottom. That made sense. The variable dimmer is what sold me. Seemed like a wise investment, so I ordered one. The learning curve wasn't difficult. Once I got it dialed in, my batch remained a constant 77-78 deg. Something I just could not do with my regular heating pad. My KT now is consistently great from batch-to-batch! I couldn't be happier! High quality and an excellent value! I ordered this heating strip (with dimmer) with my CB system. I am SO GLAD I DID! It has performed marvelously the past few months in keeping the temperature of my KT regulated. It took a few days for me to find what Hannah calls "the sweet spot." But once I figure that out it's been smooth sailing for me and my CB system! Highly recommend this product! I could not be happier with my deluxe heater. I'm a first time brewer and I really thought making Kombucha would be difficult but with the deluxe heating strip and Kombucha Kamp videos it is so simple. I haven't had any problems at all. I'm happily making and drinking my own kombucha while saving lots of money. I highly recommend the deluxe heating strip. After reading as much as I could about making kombucha, and having decided to go with the Continuous-Brew method, I ordered my kit here at Kombucha Kamp. 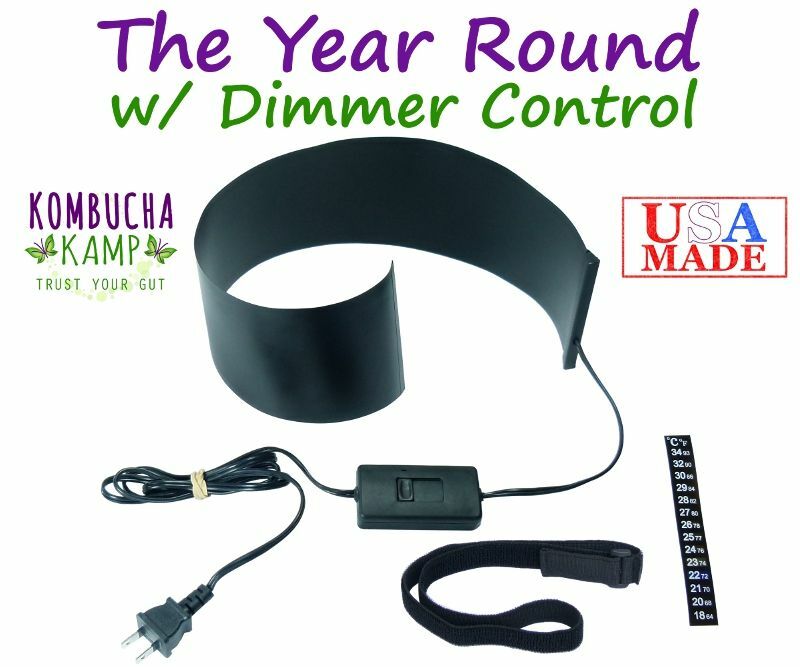 There was no question in my mind that I needed the The Kombucha Mamma Year Round Heating System with Dimmer, especially when I realized mold can be a problem if the batch gets too cold. I live in NY where it would be impossible to keep the temperature optimal without a heater. If I'm going to make kombucha and invest the money to do so, I want to do it right. The heater is easy to use and with the Aquarium Fish Tank Thermometer, it's easy to see the temperature of your brew. Great product. I'm sipping my excellent kombucha as I type this review - thank you! I love this heating system, the dimmer is a great plus. When I first thought of purchasing a heating system I was going to go with the one without the dimmer, but ended upgrading to the one with the dimmer and glad I did. So easy to adjust my kombuchas temperature, so it stays in it perfect fermentation zone. Happy Kombucha=Happy Me. I highly recommend this product, perfect for a very cold -30 below Minnesota winter. Quite possibly one of the coolest inventions I have seen. We live in Colorado and our house gets freezing cold. We tried brewing first without a heater and my son's fleece vest wrapped around the brewer but it was taking forever to turn over. Eventually my son needed his vest back so we decided to invest in the heater :) It's a definite must have for brewing if you have cold winters. Our kombucha is always at the right temp now, it's turning over faster and we think it makes it taste better too. It is definitely worth the money and I would recommend it to anyone having heating issues. Thanks Hannah! The year round heater is an outstanding,essential product for cold Montana winters. Get it. You will not be disappointed. It maintains temperature within two degrees which can be attributed to temperature changes in our home. Thanks for a great product Hannah! P.S. Try a crumbled or powdered Kaffir Lime leaf for a great flavored "booch!" I absolutely love the heating strip! It is extremely useful, especially with the heating strip. Since it's been getting really cold this winter, the heating strip has been a lifesaver for my kombucha and I. Everyone in my household drinks Kombucha, so this has made the process so much easier for me to manage it. I love this Heating unit. It fits perfectly around my brewing vessels (yes plural) and I get consistant results each time. Overall I think this is one of the best things I got for the kombucha set up! I LOVE this heater. The flexibility it provides is PERFECT for keeping my brew at the perfect temperature all year long. This strip is Awesome!!! My house is normally on the chilly side, so I was using warm towels to keep my brew warm. I ordered this just in time, because my furnace went out a few days later. My brew is still warm. I love it! My first attempts at making kombucha were discouraging. I ordered my first starter from someone else and when it came, there was just a bag of tea with directions for turning it into a mushroom. The process worked but since I was completely uneducated about brewing, I found my "tea" so gross looking that I didn't even taste it. A couple of months later a friend shared some of her brew with me. It was so delicious that I decided to give brewing another try. This time I got online and read a lot of reviews about kombucha and was led to the Kombucha Kamp website. I was excited to find so much great information and ordered a scoby and some of Hannah's tea blend. My first batch turned out AWESOME and I was excited. Then it got really cold in Utah so I sat my second gallon of brewing kombucha by the fireplace. When I checked it the scoby was scalded and the tea tasted terrible. Then I called Hannah and after a nice chat with her, I purchased the deluxe continuous brew kit with 2 extra scobys. I have a couple of gallon jars and want plenty of brew plus am intrigued with the idea of a "scoby hotel". Now that I'm using them, I absolutely LOVE both the heater and thermometer! I wish I'd purchased both in the beginning. Now that I'm using them I can see I need another heater for my gallon bottles (one heater can be used for 2 bottles) and a thermometer for each container of brew. The heater works great, a bit touchy but once its set and left alone works great. The dimable heat strip is great.before using I had trouble in the winter keeping my brew going.all is well now! I purchased the Year Round Heating system for the second time, because I'm now buying it as a gift. I love this product. My house is so cold, even in the summer, and this thermostat is so responsive to the slightest increase in temperature I can raise my continuous brew to 80 degrees in nearly minutes. I also love how Hannah herself answers the phone, answering questions and taking orders. I say buy this product. Its worth the money (and she sends coupons for giving reviews), there is no other product like it. You can find a cheaper heating mat, but you have to buy a seperate thermostat because Hannahs mat is the only one i can find that comes with it. You won't save any money and I just cant imagine anything could be better than this. The temperature mat also protects your brew, because if it get too cold it may grow some bad bacteria. After all, to buy the mat is like buying only about five weeks of kombucha if you drink it every day. Take the leap and stop thinking about it. I know you are or you would not be reading this review. I am so glad I purchased this product. I live in interior Alaska and our home is never above 65 degrees. For me, it would not be possible to make kombucha without this clever heater. Thanks to the video showing how to use it with 2 (1-gal)containers at a time, it allows for more kombucha. I ordered the Year Round Heating Strip and it works wonderful for keeping the temp at a constant temp. The strip thermometer is great to keep it on check at all times. I highly recommend anyone living in changing climates to have one of these to successfully make your kombucha. Thanks for your website Hannah and all the helpful info you provide. I purchased the year round heating system about 3 months ago, and it's kept my kombucha warm,happy,and flourishing. since the cold weather set in. I found that I can have 4 gallon jars brewing, plus three or four 16oz bottles on one heating strip and all are sufficiently warmed. I live in Anchorage, AK where the temp is below zero right now. My house drops to about 65 during the day so I ordered a heating pad to set my brew jars on. It works perfectly. I brewed my first batch of Kombucha in December in just ten days. I set my jars on top of the heating pad on a shelf and sort of blocked the whole thing from view with some recipe books. It makes a nice snug little brewing "cave." Plus I like the big size because I had enough room to set my bottles on it as well for a secondary fermentation cycle. I'm really happy with it. And so is the kombucha! I purchased the Year Round Heating Strip and I love it. Once I got it set, it holds steady even though the heat in my home fluctuates. My next purchase will be the continuous brew system. Thank you so much for a quality product. I started a continuous Kombucha brew in a 2.5 gal crock, but after several days of virtually no activity, I realized that the temp of my solution was too cold. I hemmed and hawed over going for the more expensive heating system with the dimmer, but finally decided that having a reliable source of home-brewed kombucha was worth the extra expense. Once I received it I wrapped the heater around my ceramic crock, stuck the thermometer on the side, and then pulled over the cute "Brewer Tee" set. I cranked the dial up on the heater pretty high and left it alone. Came back two hours later and WOAH...the temp was 90F! Woops, that's an effective heater! I spent the next two days checking on the temp and fine-tuning the adjustment knob until it now seems to hold an even 82F during the day, and only dips a few degrees cooler at night when our house heat is off. Last year I made one batch of Kombucha (not a continuous crock) and tried to keep it heated while sitting on top of a seed heater (that I paid $35 for locally) and even with a thick towel covering the brew making a tent over the heater, they didn't reach a good warm temp, took a long time, and didn't get as far along as I would have hoped before I needed to give bottles of Kombucha away as gifts. So now I'm back, and so glad I found a solution that works! I'm so thoroughly satisfied with my purchase that I just now called an ordered another set for my mother who is just trying her hand at making Kombucha! Thank you Hannah at KombuchaKamp!! This heater saved my kombucha. My kombucha was starting to smell a little like sulphur and lost it's fizz. It got sour rather than tangy. I decided that it needed more air and more heat to build up the yeasts. It's cold in New Hampshire, and most of the time my house temperature is in the 60's, not warm enough for kombucha. I bought your heater, and it worked- I'm back to lovely sweet/sour fizzy KT. You do have to pay attention to your settings on the heater- if your house gets warmer, you may have to turn down the heater setting. I do wish there were graduated lines on the dimmer switch, (though I got used to it anyway), and that that there was a better way to secure the heater to the brewing vessel. But, I am pleased- it did the job! The heating strip works just fine and keeps everything warm when I turn down the thermostat on the furnace at night. I have been very pleased with the blanket for my crock. It is very responsive to the slightest adjustment. I absolutely Love Hannah's Year Round Heating System With Dimmer.She also includes a self adhesive thermometer strip with it! If you want your Kombucha brewing process to be Sleek,Convenient and Precise, then this is the system for you. Customer service is always there for you, by phone or E-mail. Thank You Hannah for making the brewing process so simple! I bought the year round kombucha heater. I researched other heating 'pads', and pads i would add my own thermostat too, which was about the same cost as yours. This heater is amazing. I live in upstate ny where the sun never shines and the winds blow through your house and it can actually be colder than alaska. This heater changes the temperature on a 1.5 gallon container that i 'continuous brew" in, literally in a matter of 30 minutes. I don't even have the heater up a full half of what its capable of and the brew is at 78-80 degrees. The year round matt is so large it is wrapped around my brewing vessel, (which helps to keep it dark), as well as wrapped around another vessel for a 'second ferment'. I keep other wine bottes that i also second ferment in, just up against the primary container and the ferment is successful with the heat. I love this thing.I would buy it again and again, but its such a great product i doubt i'll have too. I hope this answers some questions the way I was looking for some questions to be answered. The heating system works very well. I had to keep a close eve on it at first to find the right tempurature for my set up but once I got it I put put a mark on the control dimmer. Now it is quick and easy to make a new batch. Thank you for a great product. This heating system is really well made and worth the extra money.I am very happy with this purchase and I recommend it. I have two of the essential heating strips w/dimmers and they work awesome! It takes a little playing around to find the setting for the perfect temp., and you want to make very small adjustments to get there, but I would recommend these to everyone who wants to be able to control the temp. of thier brew! Great product Hannah and Thanks for all your patience and help!!! I purchased the "top of the line" heating mat, with the temp control. It works perfect! Plus, it looks cool! I had another heating mat and it isn't nearly as good as the one Hannah had the engineer design for her. This thing works! My apartment can be 80 in the day and 65 at night, so the dimmer is a total essential so you don't roast your scoby during the heat of the day. Drawing a few lines next to the dial will help you adjust to your ambient temperature once you get the swing of things down-pat. I live on the Hood Canal, nestled next to the Olympic Mountains, which means more than half the year is overcast with cool days & nights. I figured if I need a comforter to stay warm, my Scobys would as well. I use the Essential Heating Strip for my Scoby Hotel and a batch jar or two and use the dimmer switch strip for my CB. I appreciate that Hannah had these manufactured to heat the tea, not the bottom of the containers. Love the kombucha heater. highly recommended. I am in LA and I do use it. I sent for the cheaper heater at first and it wasn't enough so Hannah changed it for this one really promptly. This one is SOOO good! I try to remember to tweak it a bit at night when it's colder but it works fine even if I forget. I loooove my kombucha!! I could not be without this. I am surprised how much the temperature fluctuates on my tea. This was money well spent. It get very chilly in New Hampshire so the heating strip and thermometer really are key to making awesome booch. Hanna you really have thought of everything thanks so much. Definitely worth the money! I live in a damp environment (Pacific Northwest and also spend a lot of time in Yellowstone, which as very tempermental weather), so without a doubt this heating strip was worth the big bucks I spent for it! Just started using it and it already has my Kombucha at the exact temp I need it at! I love the temp strip that comes with it, so you know exacly what temp you have your KT and if you need to adjust the dimmer. Dont settle for cheaper versions of this in any sort of way. You get what you pay for, and I cant wait to see how this improves my KT! Thanks Hannah! Love the heater strip. We keep our house cold. The dimmer is essential since my house temperature fluctuates when we are not home and at night. Careful though. The dimmer has a big change for a small move of the dial. The heating strip is an essential part of my kombucha continuous brewing system. The bacteria are kept at the perfect temperature for their mischief. Here in New England, cold temperatures would slow the growth process. With this heating strip, designed perfectly for the CB system, I have a gallon of fresh KT every 3-5 days. I'm so happy that I found The Kombucha Mamma Year Round Heating Strip with Dimmer before wasting my money on any other heating pad. Easy to operate, this handy gadget will pay for itself in no time, with perfect brews of KT every time-- even for a newbie in the middle of a Canadian winter! Loved finding Hannah / Kombucha Mama/ Kombucha Kamp on You Tube.. Watched quite a few of her simple demonstrations-- her demonstrations are simple and empowering! Spending a bit more for the heater with the thermostat is definitely the way to go for our area which gets cold in the winter. The thermostat is sensitive and keeps my KT at just the right temperature. It give me the freedom to be gone for a few days and know that the KT is still the perfect temperature even though the house is cooler while we're gone. This was a great idea Hannah!Thanks. I really like this heater. I'm just starting my first time ever brewing kombucha and chose it for its versatility and convenience, and I think this heater and all of Hannah's information is helping me get set up right. Compared to the seedling mats, etc, this is a much nicer set-up. I emailed Hannah to ask about guarantee or warranty and while she said it does not have one, she said it should last a long time and I felt confidence in her sincere customer service. Hannah's heat mat with the dimmer switch is THE BOMB! It works great! I don't have to worry about my kombucha brewing in my cool environment. It works like a charm! Hannah's customer service is first rate too! When I got the dimmer switch there were a few wires exposed and she quickly replaced it. Thanks for all you do, Hannah! I LOVE IT!!! I live in a basement, so temperature is a real problem. I tried a heating pad but the only way to control it is constantly turning it off and on. Hannah's Year-Round heating system is PERFECT! Now its always the right temperature! Well worth the expense. Thank you Kombucha Mama! Have had this heating strip with dimmer for two weeks. Very pleased with it already! I just started brewing Kombucha and knew immediately that I’d need a heat source to make it work in Canadian winters. This system made the most sense after researching my options – especially having the dimmer switch. I wish I had read the review above regarding the thermometer. I went out and purchased and applied a thermometer just a few days before my heat strip arrived. I didn’t realize that one would be shipped with the heater. Also, it’s a little more expensive than I’d like (plus I paid for shipping to Canada) but I’m hoping to see health benefits with my kombucha and you can’t put a price on that. Overall a great product and does what it says! Thanks Hannah! I am currently working on my very first batch! After doing some research and reading these reviews, I purchased this. It works as promised and is keeping my brew at a constant temp. in my cold basement! I am enjoying the modifications that were made due to other's feedback. I believe this heater will help to make me a successful kombucha brewer! I would also strongly recommend the Year Round Heating System with Dimmer. It is a must if you want to get the most out of your Kombucha & maximize the brewing process. I have been batch brewing previously & I almost immediately noticed the difference in the look, growth & health of my SCOBY as soon as I was able to bring my brew to the correct temperature. The Heating System is very flexible & thin but extremely effective! This heating strip is a Life Saver!!!! My apartment has been really cold for a month now and if it wasn't for the heating strip my Kombucha would have taken forever to frement. It just speeds up the process. The heating strip is worth the money and it's only a one time buy. It's a really good investment. You can easily adjust the heat that you want. Hannah is a genius for inventing this heating strip! Thank you Hannah! I LOVE this strip. It saved my Kombucha. We live in the high desert of Eastern Oregon and it gets darn cold here. It has been in the teens at night for over a week here already and it is not even winter yet. I had my continuous brew on a Kombucha heating plate. It has not adjustment and it was getting too warm. I got this new Heating System with dimmer and I can control the amount of heat my brewer gets. No more cooking my brew! I still have plenty of room on the adjustment to raise the heat when it gets really cold.This is a great design, thin, flexible, and it has a nice long cord. Ty Kombucha Momma for this great heater. This product has made the difference in home brew or paying $5 a bottle. I really love this heating strip. It comes with the thermometer so you just can't go wrong. Thanks Hannah your Customer Service is Awesome! summer no problem; but winter in the midwest that brewer needs a heat tape and this is the way to go! I tried a heating pad and it just did not do the job. The SCOBY need a continuous temp to be safe and the heat tape does that. This heater works great. Actually it works too great if you're not careful which I learned the first day. It will heat the crock up quickly and get too hot if you don't watch it. Used the thermometer to get it right. Nice heater. I very highly recommend Hannah's HEATING SYSTEM WITH DIMMER. Its very helpful! !I'm happy with this product. Thank you Hannah! I live in New York and we had a very cold winter this year and it gets pretty cold in my apartment and very hot in summer. The great thing about the year round heating system is that you can adjust the amount of heat. the only problem is that you don't know the temperature of the kombucha. Get yourself an Aquarium Fish Tank Thermometer with Adhesive Back. place in front of your brewer (outside) and there you go - best system ever! ~~~Reply from Kombucha Kamp ~ "Hey Erminio, that's exactly what we've done. Now every Year Round Heating System comes with a thermometer. Thanks for the feedback! :)"